Snakes are legless reptiles that move about by slithering on their bellies, though their physical appearance can vary significantly depending on the individual species. Their coloring can also vary widely from shades of vivid green, red, yellow, and blue to darker, milder blacks, browns, and tans. 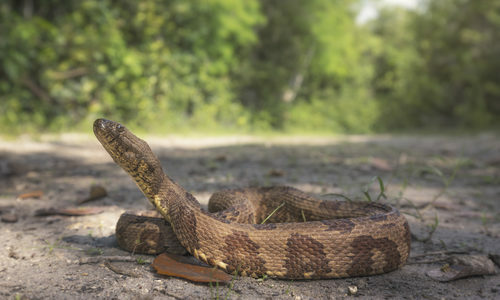 Most snakes that are found in the United States are nonvenomous and don’t pose any risk of danger beyond fright, though there are a few venomous and poisonous varieties. Snakes are carnivorous and will eat frogs, worms, insects, rodents, birds, and similar small prey. Not all snakes reproduce the same way – some lay eggs and some give live births – though the most common snake found in home infestations is the garter snake, which participate in live births of up to 50 individual babies at a time. Yes – and no. There are many, many different varieties of snake from the non-venomous garden snake to the venomous and dangerous copperhead. There are no infallible ways to know that a snake is venomous, so our first recommendation if you experience any sort of snake in your home or business is to immediately call pest control professionals to come and assess the situation. There are a few rules of thumbs you can follow when trying to identify whether or not a snake is venomous or poisonous, however. Most venomous snakes in North America have triangle shaped heads and oblong slit-shaped pupils. Most poisonous snakes have heat sensing pits (small nostril-like areas) located beneath their eyes and commonly have bright coloring. Either way, if you see a snake on your property that you don’t recognize – don’t approach it without professional help. Like any other predator, snakes are attracted to easy food sources, so if you have a snake infestation it’s very likely that there are other pests in and around your home as well. Calling in pest control professionals to do a thorough sweep of your home or business on a regular basis can help you make sure there aren’t any food sources hiding in your home to bring in snakes. How can I prevent snakes? Being surprised by a snake in your yard or garden is never a pleasant experience, but there are ways to motivate them away from your home or business. The first thing to do is make your outdoor living space unappealing for snakes by clearing away piles of debris and leaves they could build nests in from the environment. That plus making sure there are no holes in your home’s exterior walls for them to get in through are going to be your best defenses against a potential infestation. How can Gregory Pest remove snakes from my home or business? An expert exterminator from Gregory Pest Solutions will be your full-service pest solutions provider specializing in the effective, humane removal and prevention of reptiles and snakes. Our inspection and treatment is thorough, but more importantly, safe for your family or your commercial needs. When you hire us to evaluate your home’s problem, one of our pros will be sent to assess the reptile situation and then formulate an environmentally friendly plan. Once we implement our plan, our experts will clean the area and seal any openings, so you and your family can enjoy a lasting reptile-free environment. You want to enjoy your home free from unhealthy, distracting pests. Did you know you could accomplish this without declaring war on nature? Gregory offers smarter pest solutions. Let nature enjoy its world while we enjoy ours.